One of the important Islamic festivals celebrated all over the world is Milad-Ul-nabi or Maulid. This day commemorates the day of birth of the prophet Muhammad. It is also the day of his death. The day is remembered through songs, stories and preaching where the prophet’s life and his teaching are discussed. It is a day of happiness and festivities. Prophet Muhammad is the founder of Islam. Milad-Ul-Nabi is the day commemorating his birthday. The festival was begun by the descendants of the prophet through his daughter, Fatima’s house. In 8th century, the house where the prophet was born was transformed into a place of worship by the mother of Harun –Al –Rashid – the most famous Caliph of Baghdad. The festival gained popularity since the 12th century and today, it is celebrated throughout the Muslim world and also in India. Milad –Ul-Nabi is celebrated on the twelfth day of Rabi-ul-Awwal, which is the third month of the Islamic calendar. This was the day on which the prophet was born. However, the Shia community celebrates the festival on the 17th day. This day is both the day of birth and death of the prophet. It is also the day on which the spiritual reins of the Islamic world was handed over to Hazrat Ali. Milad-ul-Nabi is known by a number of other names. The most popular one of them is Mawlid meaning the birth of the prophet. It is also known as Eid-e-milad. Milad-ul-Nabi is the time for celebration. It marks the joyous occasion of the birth of the prophet. Though the prophet passed away on the same day, it is not a time for mourning because Muslims believe mourning beyond three days after death is not good for the soul. People dress in new clothes and gather together to remember and discuss the life and teachings of the Prophet Muhammad. Special prayers are offered to Allah for his graciousness in sending Prophet Muhammad to show the path of salvation. Night long prayer meetings are also held. Lectures and recitations are held on the life of the prophet and people attend to them throughout the day. Often, poetry is recited after the prayers. People visit friends and relatives in social gatherings. Alms are given to the poor. Processions are taken out in many areas. 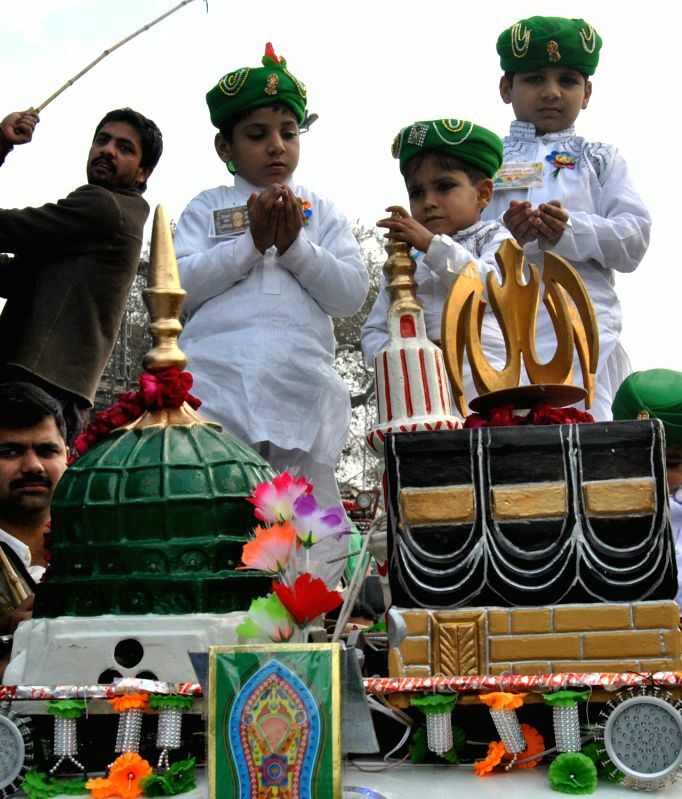 At the Hazratbal shrine in Kashmir, Milad-ul-Nabi is of huge importance. A hair from Prophet Muhammad is preserved here. Thousands of Muslims gather here to pray and the holy relict is put on display after the morning prayers. One of the common rituals associated with milad-ul-nabi is Urs. This is a holy procession where symbolic footprint of the prophet engraved on stone is put in a decorated glass casket and anointed with sandal paste as it is taken on a parade.